Struggling to sell your goods or services? Whether you design beautiful pieces of jewelry, you bake out-of-this-world gluten-free brownies, you soothe your clients’ achy muscles with hot stone massage, or you help women lead more creative lives, you need to make it easy for your perfect peeps to say YES to what you have to offer. But sometimes it feels awkward or icky trying to articulate what you’re selling. Imagine what could change for you if you felt empowered and confident communicating your products and services (no matter what stage you’re at in your biz or what you have to sell). And imagine how many more people you could help because they’re signing up for what you have to offer. If you’ve been struggling to sell your goods or land new clients, give yourself the gift of this proven right-brain framework for authentically packaging your gifts and crafting your offers. 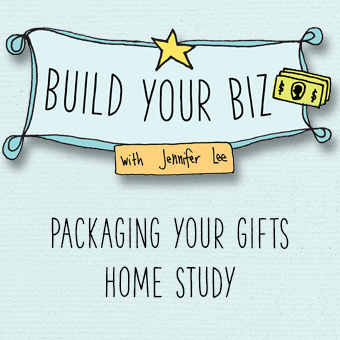 Let’s get going with the Build Your Biz: Packaging Your Gifts and Crafting Your Offers Home Study! 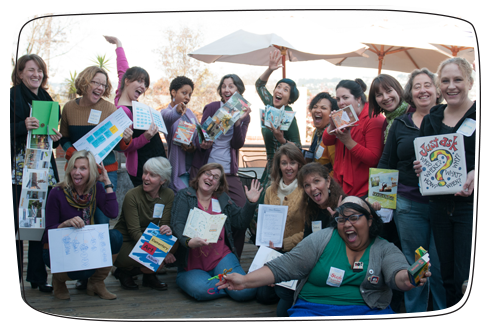 Sharon sold out her teacher training even before her early-bird deadline! “Recently I decided to revamp my yoga teacher training. With Jennifer’s help I was able to create a whole new format for my training, develop a new pricing structure that helped cash flow and create a wonderful incentive that encouraged early registration. Plus she was instrumental in helping me in writing and designing a love letter (aka sales page) that spoke beautifully to the students I wanted to attract. If you’re just starting out in your business, it’s important for you to make your first offer so you can bring in moola. But it can be challenging to articulate what you do, put a price tag on it, AND tell people about it. The teachings, exercises, and examples in this module will take the scare factor out of all of that and will give you a framework for making your first offer or fine-tuning an existing one. Even if you’ve been in business for awhile, chances are you’d still love to increase your sales, right? Clearly communicating a compelling offer can make the difference between so-so sign-ups to selling out. This info-packed module gives you the tools and skills you need to revamp and refine your offers and sales pages for better results. How is this Build Your Biz Packaging Your Gifts module different from your other courses? The Packaging Your Gifts Home Study module is part of the Build Your Biz suite of modules. These Build Your Biz Home Study modules are a good fit for creatives looking to grow an existing business. You already have a sense of what your business is and who you serve but you’re struggling with making sales, you’re uncomfortable marketing yourself, you’re frustrated with your finances, you’ve been stuck in the same place for awhile or you’re burnt out from doing too much. The Packaging Your Gifts module specifically helps you with crafting your offers and creating your sales pages. If you’re brand new to your business, the Right-Brain Business Plan® Home Study is a good place start because it will help you lay the foundation. Then you can dive into the Build Your Biz Home Study modules once you have a sense of your overall business. The Right-Brain Business Plan® Home Study helps you get your business plan done in a creative and visual way. You’ll get clear on your big vision, your perfect customers, your general marketing plan, financial goals, and more. The Product Development Playground Home Study helps you turn your special gifts, teachings, and know-how into tangible or digital products like an e-Book, e-Course, audio or video series, program, summit, kit, or other creative product so you can impact more people around the world, in less time, and make more money. The Product Development course specially covers taking an idea from concept, prototyping, testing, producing, and launching. There is some minor overlap but this module address sales pages which isn’t covered in much detail in the Product Development course.